The Baka people, known in the Congo as Bayaka (Bebayaka, Bebayaga, Bibaya), are an ethnic group inhabiting the southeastern rain forests of Cameroon, northern Republic of the Congo, northern Gabon, and southwestern Central African Republic and South Sudan in western Equatorial state that sharing the border with Congo and Central African Republic. They are sometimes called a subgroup of the Twa, but the two peoples are not closely related. Likewise, the name "Baka" is sometimes mistakenly applied to other peoples of the area who, like the Baka and Twa, have been historically called pygmies, a term that is no longer considered respectful. Baka people are all hunter-gatherers, formerly called Pygmies, located in the Central African rain forest. Having average heights of 1.52 meters (5 feet) in average as well as a semi-nomadic lifestyles, the Baka are often discriminated against and marginalized from society. They reside in southeastern Cameroon, northern Gabon and in the northern part of the Republic of Congo. In Congo, the Baka people are otherwise known as the Bayaka. Some Baka are also found in southwestern Central African Republic. Although the Baka people are located throughout the Central African rain forest, they are mainly concentrated in Cameroon as the Baka community of Cameroon represents roughly 30 000 individuals. The Baka are a semi-nomadic people, like other hunter-gatherers such as the Bagyeli and the Twa. However, they are slowly becoming a more sedentary people due to the intensive deforestation of the Central African Rainforest. Pressures from their taller and more dominant neighbors, the Bantu, have also slowed the Baka people’s mobility. The Baka have successfully maintained their language, also called Baka. Unlike their neighbors’ languages (Koozime, Bakoum and Bangandou) which have Bantu roots, Baka comes from a different language family, Ubangian. The oldest reference to "pygmies" dates back to 2276 B.C when Pharaoh Pepi II described seeing a "dancing dwarf of the god from the land of spirits", in a letter to a slave trade expedition leader. In the Iliad, Homer described the "pygmies" as dark skinned men in warfare with cranes. They were as tall as a "pygme" which meant that they measured the length of an elbow to a knuckle, or about one and a half feet long. About three centuries later (500 B.C), the Greek Herodotus reported that an explorer had seen, while travelling along the West African Coast, "dwarfish people, who used clothing made from the palm tree". In 1995, Joan Mark wrote The King of the World in the Land of the Pygmies, an interpretive biography of Patrick Tracy Lowell Putnam, the anthropologist who spent 25 years living among the Bambuti "pygmies" in Zaire. Mark writes that Aristotle, in 340 B.C, was the first to relate, in his Historia Animalium, the small men Homer accounted for in the Iliad, to those seen previously on the African coast. He goes on to explain that, due to the chasm that existed between Europe and Africa after the collapse of the Roman Empire, most Europeans living in the 18th century believed "pygmies" to be mythical creatures. In 1890, the Welsh journalist Henry Stanley gave, according to anthropologist Paul Raffaele, the first modern account of the existence of "pygmies". In his book, In Darkest Africa, Stanley described meeting a "pygmy" couple. Stanley writes of them: "In him was a mimicked dignity, as of Adam; in her the womanliness of a miniature Eve". In 1906, a Congolese "pygmy" Ota Benga, was exhibited, among apes, at the Bronx Zoo in New York City. According to The New York Times, Ota was 4 feet and 11 inches. This episode is still extremely controversial today as a The New York Times article was written about Ota more than 100 years later. According to the Times, black clergyman and superintendent of the Howard Colored Orphan Asylum in Brooklyn, Reverend James H. Gordon, deemed the exhibit to be racist and demeaning. "Our race, we think, is depressed enough, without exhibiting one of us with the apes," Mr. Gordon said. "We think we are worthy of being considered human beings, with souls." The Baka people are the principal hunter-gatherers of the tropical rainforest of Central West Africa. Groups establish temporary camps of huts constructed of bowed branches covered in large leaves (though today more and more homes are constructed following Bantu methods). The Baka hunt and gather their own food. The men hunt and trap in the surrounding forest, using poisoned arrows and spears to great effect. The men also welcome the help of dogs when going on hunting excursions. Fishing is very important in Baka culture as young boys are taught to use fishing rods at a young age. The men fish using chemicals obtained from crushed plant material. Using fast-moving river water, they disperse the chemical downstream. This non-toxic chemical deprives fish of oxygen, making them float to the surface and easily collected by Baka men. Another method of fishing, performed generally only by women, is dam fishing, in which water is removed from a dammed area and fish are taken from the exposed ground. Children and adolescent-girls often accompany the women when they go fish-bailing in nearby streams. More than only fishing with adults, their job is also to help the women by watching over the infants while they fish. Women cultivate plants, such as plantains, cassavas and bananas, and practice beekeeping. The group remains in one area until it is hunted out. It then abandons the camp and settles down in a different portion of the forest. The group is communal and makes decisions by consensus. 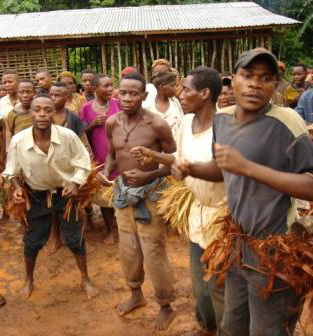 During the dry season, it is common for the Baka to move and set camp within the forest in order to facilitate fishing and overall nutritional gathering. The Baka are the most active during these dry seasons. Men hunt from dawn until dusk and the women gather two types of fruits: the "mabe" and the "peke", which are used for the provision of juice and nuts. The Baka people continue to monitor bee activity in order to obtain honey or "poki". The Baka worship the forest spirit called Jengi (also known as Djengui or Ejengi). The spirit plays the role of the mediator between the supreme being, Komba, and the Baka people. The Baka thus compare Jengi to a protecting father or guardian. They strongly believe and revere Jengi as they believe that he is the only way to Komba. The Baka people believe Jengi to be omnipresent within the forest allowing him to punish transgressors within the confines of the forest. Ultimately, the Baka worship nature as it is Komba, not Jengi, that resides in it. "Emerging from the shadows were half a dozen Baka men accompanying a creature swathed from top to bottom in strips of russet-hued raffia. It had no features, no limbs, no face. "It's Ejengi," said Wasse, his voice trembling. At first I was sure it was a Baka camouflaged in foliage, but as Ejengi glided across the darkened clearing, the drums beat louder and faster, and as the Baka chanting grew more frenzied, I began to doubt my own eyes." Death is considered to be a misfortune for the Baka. They deem the death of one of their own to be a representation of spiritual discord. Each tribe, having witnessed the death of one of their own, is required to pray to Jengi and dance around the debris covered corpse for an entire night. The dance performed during the death rituals is called the Mbouamboua. After a long night of dancing, the villagers depart from where they were stationed, leaving the corpse behind, and set out to move somewhere else in order to flee the curse. Traditional Baka medicine mainly involves herbal remedies. Various plants may be brewed or mashed into a pulp to treat various illnesses or infertility. These remedies are often used on children, as the areas where they are most used have high child mortality rates. While the efficacy of these remedies has not been proven, this traditional medicine is so renowned that even non-Baka seek out their healers for treatment. Many Baka people have had Ebola but not one ever displayed any symptoms. In socio-economic and political spheres, the Baka people are not seen as equal to the Bantu villagers. The Baka rely on the farmers for trade opportunities. They exchange some of their primary goods (fruits, wild nuts, medicinal plants etc.) for money and industrial goods. The farmers are the Baka’s only connection to the modern Cameroonian or Gabonese bureaucracies. Because of this, the Baka often work as indentured servants to the farmers. The Baka thus follow most of the farmers’ orders. This unbalanced relationship often causes tensions between the two groups. These inequalities are perpetuated by the fact that some of the villagers speak French (the national language of Cameroon and Gabon) but none of the Baka do. The Baka People form an acephalous society, one in which there are no political leaders or hierarchies. This makes it difficult for the Baka to assimilate to the political landscapes of Gabon and Cameroon. According to anthropologist Alec Leonhardt, the Baka people are deprived of their human rights. Leonhardt explains that the fight for Baka rights is not on Cameroon and Gabon's political agendas and neither is it on the "policy agenda" of the U. N Draft Declaration on the Rights of Indigenous Peoples, a working group whose purpose is to fight for the rights of indigenous peoples. Being hunter-gatherers as opposed to farmers, the Baka face troubles when education is concerned. Because the Baka are an ethnic minority in both Cameroon and Gabon, they are often either excluded from their respective school systems or forced to forgo their culture and assimilate to the Bantu. Formal schooling for Baka youth can often be difficult for them to handle because it does not fit in with their nomadic way of life. According to anthropologist Kamei Nabutaka, although there are public schools for all children, the Baka often choose not to attend because education is generally not a central part of Baka culture. Secondly, she explains that the Baka choose not to attend school due to their physical distance from these schools as most of the formal schools are built outside of Baka settlements. The Baka also tend to feel uncomfortable in these public schools as they are often despised by their Bantu neighbors and made fun of for their small height. Furthermore, they do not feel at ease when attending school because they do not understand the language as the only languages accepted within these schools are French and Bantu languages. Kamei also describes the economic reasons behind why the Baka children do not attend public schools. Baka parents are often unable to afford sending their children to school as only a small fragment of the Baka society is pecuniary. In recent years, deforestation of the tropical forest has greatly increased. For example, some deforestation projects have been initiated in order to procure palm oil which is heavily found within the confines of the forest. Survival International has recently set up an initiative to help the Baka people survive the extreme deforestation of their homes. Deforestation impacts the Baka as the forest is their home. Anthropologist Shiho Hattori, recorded about 100 instruments that the Baka use daily for cooking, hunting and gathering, rituals etc. Out of these 100 utensils, Hattori reports that 40 (or about 2/5) of these utensils were made "partly or entirely out of natural resources" found in the forest. These deforestation projects can be extremely detrimental to the Baka as they will be destroying the environment on which they so heavily rely for absolute subsistence as well as for economic standing in face of the farmers. The Catholic missionary group, Frères des Ecoles Chrétiennes (F.E.C) set up an initiative to ease the Baka youth into the formal schooling system by creating the Mapala School in 1992. The F.E.C encouraged Baka teachers to teach in both French and Baka languages. Parents were also able to pay a cheaper 500 FC (or about 1 USD) for their children to learn skills relevant to the Baka lifestyle during class time. This initiative helped lessen the cultural gap between the Baka and the Bantu. In 1998, the Jengi Project, a conservation project, was initiated in order to protect three important regions of the forest: Lobeke, Boumba (also Bek) and Nki. Project leaders set up measures in order to attain their goal of conserving the richness, in species and in foliage, of the tropical forest. One of these measures, for example, was an increase of hunting regulations within the forest. These leaders attempted to get the Baka on board with the project as these new regulations would not only help them preserve their natural habitat but would also affect their living tendencies. The concerned Baka group, however, was not very responsive and did not seem to want to partake in the project. The farmers, on the other hand, seemed to be very intent on doing their part to support the effort. Anthropologist Hittori, suspects that the Baka may have been indifferent to the project as they believed that this was simply another way for the farmers to increase their dominance over them. ^ Lunch, Nick. "Cameroon". Archived from the original on 5 December 2013. Retrieved 3 December 2013. ^ "The Baka Forest People". Retrieved 21 October 2013. ^ a b c d e f g h "IC Magazine: Supporting the Indigenous Peoples Movement". Archived from the original on 21 October 2013. Retrieved 21 October 2013. ^ Paulin, Pascale. "LES PYGMEES BAKA DU GABON : APPROCHE SOCIOLINGUISTIQUE" (PDF). Retrieved 21 October 2013. ^ Devin, Luis. "Baka Pygmies". Retrieved 21 October 2013. ^ Bianchi, Robert S. (2004). Daily Life of the Nubians. Greenwood. p. 49. ISBN 978-0313325014. ^ a b c d Raffaele, Paul (2008). "The Pygmies Plight". Smithsonian. 39 (9): 70–77. Retrieved 21 October 2013. ^ "Pygmaioi". Retrieved 21 October 2013. ^ Keller, Mitch (6 August 2006). "The Scandal at the Zoo". The New York Times. Retrieved 21 October 2013. ^ a b c d e f g h i Kamei, Nobutaka (2001). "An Educational Project in the Forest: Schooling for the Baka Children in Cameroon". African Study Monographs. 22 (Supplementary Issue): 185–195. doi:10.14989/68400. ^ a b c d e f Hattori, Shiho (March 2005). "Nature conservation and hunter gatherers' life in Cameroonian rainforest". African Study Monographs. 29 (Supplementary Issue): 41–51. doi:10.14989/68446. ^ a b c d Azombo, Franklin. "Le Synode du Diocese Du Batouri". Regard sur la culture et la religion des Bakas. Retrieved 22 October 2013. ^ Cite error: The named reference The Baka Plight was invoked but never defined (see the help page). ^ "Many in West Africa May Be Immune to Ebola Virus". New York Times. September 5, 2014. ^ a b Leonhardt, Alec (September 2006). "Baka and the Magic of the State: Between Autochtony and Citizenship". African Studies Review. 49 (2): 69–94. doi:10.1353/arw.2006.0110. ^ "Tropical deforestation for Palm Oil in Cameroon". Wildlife Conservation Fund. Retrieved 4 November 2013. ^ "'Pygmies' - Survival International". Retrieved 3 December 2013. Fanso, V.G. (1989) Cameroon History for Secondary Schools and Colleges, Vol. 1: From Prehistoric Times to the Nineteenth Century. Hong Kong: Macmillan Education Ltd.
Neba, Aaron, Ph.D. (1999) Modern Geography of the Republic of Cameroon, 3rd ed. Bamenda: Neba Publishers.